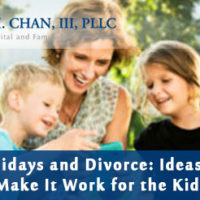 Although Christmas and the holidays are usually a time for celebration, this can add additional confusion and problems for a couple recently going through a divorce or a couple who is separated and planning to file for divorce. There are several different things that you can do in order to support not just children but yourselves during this time so as to minimize drama and other problems. One of the most important things you can do if you are thinking about filing for divorce is to consult with an experienced Florida divorce attorney immediately to discuss your options. You may also already have a visitation agreement or a parenting agreement that documents the actual time that should be spent with each party, but there are other steps that you can take to minimize drama between you and a former spouse. Although you will likely be emotionally triggered not seeing your children every minute of the holidays or having to communicate with your former spouse in order to get things done, your children do deserve to experience their celebrations even if you feel that you have been unfairly cheated out of yours. Try your best to encourage your children to have a positive interaction with the other parent even if you are upset about being alone. You do not need to give your children the additional burden of worrying about whether or not you are alone or miserable on any holiday. There are many other lessons that can frequently come along with the holiday season aside from spending time with your family. For example, fresh starts, forgiving, and giving are some of the key highlights of the Christmas and holiday season. As you approach New Year’s resolutions too, this gives you an opportunity to reflect back on your own behavior with your former spouse this year or even your children and think about how you can do better. Your children should be aware of the true meaning of the holiday, not the meaninglessness of getting as much gifts as possible. If you cannot cooperate with the other spouse to talk about splitting up the Christmas list, try your best to be positive and avoid having this turn into a competition of who can buy more for the children. make sure that you know exactly where the children will be, when, where and how any exchanges will take place. Figuring this out well in advance decreases the chances that there will be any drama on the day of a holiday and it helps your children feel more secure. You as the parent will also have a less likely chance of feeling disappointment and frustration. If trying to figure things out at the last minute was stressful or aggravating for you this year, use this as a learning opportunity to set a plan for next year now or after the holidays are over. Everyone will be happier knowing what is coming and will be able to plan their own lives accordingly. Getting things together now minimizes conflict and makes things easier with everyone. Even though your traditions this year may be different from part experiences, this is still a good opportunity to teach them about the value of forgiving, moving on and establishing your own new traditions. If you have stuck with something in the past that was tied to spending time with your spouse, now is the time to suggest a new opportunity to work together and create new memories. Allow your children to be involved in the process of selecting some of these new traditions. They are likely to feel even more excited about it when they feel as though they have a voice in the process. If you have questions about divorce and how to better equip yourself for the holiday season ahead, don’t wait to reach out to an experienced divorce attorney Tampa. A Florida divorce lawyer can help you navigate this complex process and avoid challenges.